Monday was a day for the history books for Dirk Nowitzki. In front of a sell-out crowd at American Airlines Center, Nowitzki passed Hall of Famer Wilt Chamberlain for the sixth-most points of all time. 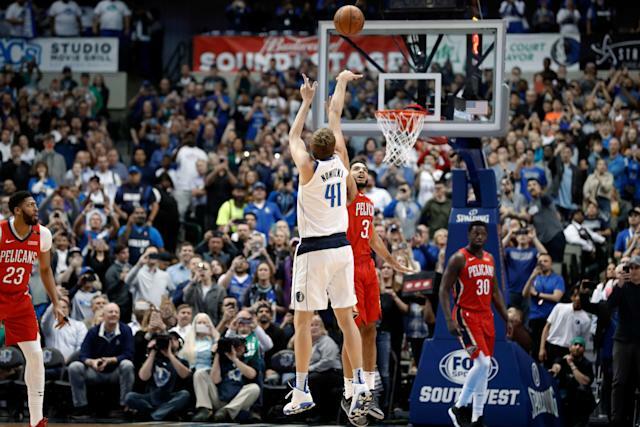 And he did it in the most Dirk way possible: by hitting a fadeaway 20-foot jumper. The Dallas Mavericks 7-footer came into the night just three points shy of Chamberlain’s 31,419 career mark and needed less than four minutes to pass him in Monday’s game against the New Orleans Pelicans. Nowitzki finished the game with eight points in 12 minutes on 3-of-6 shooting. Nowitzki is averaging a career-low six points in 13.8 minutes per game, and many people believe this will be his final season. NBA commissioner Adam Silver named Nowitzki and Miami Heat star Dwyane Wade to this year’s All-Star game as special roster additions as a send-off gift of sorts. The Mavericks sent out a mysterious message from their Twitter account on Monday afternoon with the message “41.21.1”, which many people assumed would mean that Nowitzki might also announce his retirement. Of course, 41 is his number, and he’s spent 21 years in the league with one team. With just 12 games left in the season — and quite likely his career — there are only so many more records Nowitzki can break. Even if he played another season, he would be unlikely to pass Michael Jordan for fifth place — as LeBron James just did — since that would take another 868 points. However, Nowitzki can extend his record for most points scored by a player born outside the U.S. — a record two of his teammates may later threaten. Nowitzki passed Houston Rockets legend Hakeem Olajuwon in 2014 and has outscored him by 4,478 points. Nowitzki could also move up slightly on the all-time rebounds list. Although it wouldn’t be a nice, round number, Nowitzki (11,423) can still pass Elgin Baylor (11,463) for the 27th-most career rebounds. That would require 3.3 rebounds per game down the stretch, although he averaging only 2.4 boards per game on the season.